My introduction to Sean O’Casey’s Juno and the Paycock came when I was an undergraduate at Brandeis University through a memorable black-box production where the audience sat tennis court-style on either side of a long, rectangular playing area. I recall being continually caught up short by the tonal shifts and amazed by the depth of the tragedy undergirding the domestic comedy: the battles between the long-suffering working-class Dublin housewife Juno Boyle and her indolent husband – known as the Captain because of a brief stint he spent on a ship, which he’s fanned into a romantic tale of maritime adventure – who fakes pains in his legs whenever the chance of a job rears its ugly head, preferring to spend his hours tossing back pints at one of the local snugs with his neighbor Joxer. These two incorrigible codgers are the only ones left on stage at the end, when the Boyle family has been torn apart and the creditors have claimed the furniture; they stumble onstage drunk out of their minds and pass out, in a moment that looks forward to the final curtain of Eugene O’Neill’s The Iceman Cometh (where the stage is littered with aging, hopeless dipsomaniacs). In the Brandeis production, one of the pair rolled a whiskey jar to the dead centre of the stage; for the final stage picture, the lights faded to a single special on the empty jar. The tragedy of Johnny’s murder, which follows the twin revelations that Mary is pregnant by a man who’s abandoned her and that the family is finally destitute, lies at the fag-end of a drama that begins as a comedy. Captain Boyle and Joxer’s schemes to avoid work and escape Juno’s detection – which always fail – are presented initially as comic escapades, and at the end of Act I (the play is in three acts) the Boyles get the news that the Captain has inherited what is to them a small fortune from a cousin. It’s a classic set-up: the money brings out the Captain’s pretentiousness, neighbors treat the Boyles like aristocrats, and they overspend foolishly. We wait for the inevitable blowback, followed by an eleventh-hour rescue. 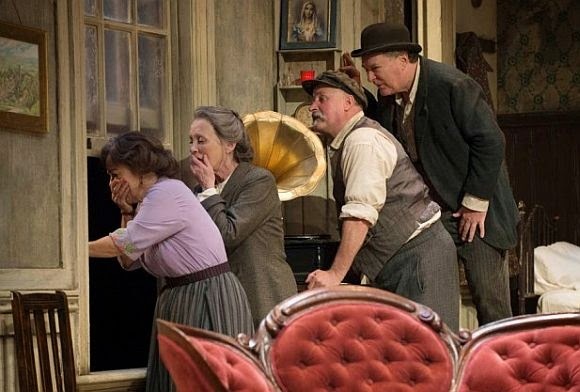 But the play is a piece of realism, and when the Boyles find out that, after all, they’re not going to get any money, there’s no salvation for them; the entire story of the inheritance vanishes like a mist. The trick to performing Juno and the Paycock is achieving tonal balance. In the current, mixed production at the Shaw Festival, helmed by artistic director Jackie Maxwell, the comedy tends to be of a sitcom nature and the tragedy is sometimes inflated, pushed too hard, so that it comes across as melodrama. The actors shout too much – the Royal George Theatre isn’t large enough for all that volume – and both the farce moments (like the boisterous Maisie Madigan’s efforts to recover a loan from the Captain after the neighborhood has discovered that he’s not going to be rich) and the most dramatic ones (like Johnny’s being taken away by the IRA) are clumsily staged. But the biggest problem is the casting of Shaw veteran Mary Haney as Juno. Haney has considerable technical know-how but no subtlety. From the beginning she plays Juno as tough and sinewy; she has a way of twisting her face into a scowl that both makes Juno look exactly like half a dozen other characters I’ve seen Haney play and turns O’Casey heroine into an emblem. When Mary bemoans the fact that her baby won’t have a father and Juno answers, “It’ll have what is far better. It’ll have two mothers,” Haney reads the line like a feminist proclamation, which rings completely false for the play’s 1922 setting. And she goes so far over the top in act three, making a meal out of Juno’s response to the back-to-back revelations about Johnny’s death and the lost inheritance, that the scene loses its power. I saw Dearhbla Molloy play this role in an off-Broadway production in 2000, directed by John Crowley, and the force of fate’s blows exposed deeper and deeper layers of pain and quiet strength, as they do in the grief-stricken principals in The Trojan Women. Haney’s performance deteriorates into stock theatricality. The actors around her are good enough to counter much of the production’s tendency toward overstatement. As Boyle, Jim Mezon is often too big; that’s his flaw as an actor. But he’s a superb technician and an imaginative one, and he hits all the notes – the comic and the tragic ones – in the writing of the Captain. He has one moment that I think is inspired: when he plays one of his new acquisitions, a Victrola (bought with money, of course, that exists only in theory), he executes a silly little mock-march up and down, underscoring the miraculous nature of this machine and making a joke of his pleasure at the same time. Benedict Campbell counters Mezon by underplaying cleverly as Joxer, that colossal fake who lives off the generosity of his friend, flattering him shamelessly by expanding extravagantly on all his likes and dislikes and then, when he sees that the well has run dry, joining the other neighbors in enjoying the spectacle of the “paycock” brought low. Marla McLean gives a lyrical reading of the ingénue role, Mary; Charlie Gallant makes jittery, neurotic Johnny as haunted as a doomed figure out of Poe. Andrew Bunker’s portrait of Jerry Devine, the leftist worker whose unrequited love for Mary, like his liberalism, turns out to have limitations, is beautifully drawn; this is Bunker’s twelfth season with the Shaw, and he’s grown into a solid character actor. The role of Charles Bentham, the lawyer who brings the news of the will, romances Mary and then deserts her, is a little underwritten, but the gifted Gord Rand fills it in, adding unstressed layers of self-adoration and condescension. (He hands off his hat and coat when he enters the Boyles’ flat as if he were used to the toadying of those he believes to be his inferiors.) Best of all is Jennifer Phipps, whose single second-act scene as the mourning Mrs. Tancred is the highlight of the show. This is the scene that shifts the play’s tone for good and all, and though I’ve seen it played as well by other actresses – like Roberta Maxwell in the Crowley production – I’ve never seen it played better. Phipps, like a number of the Shaw’s older company members, tends to be underused, but she always brings color and intensity to her appearances. 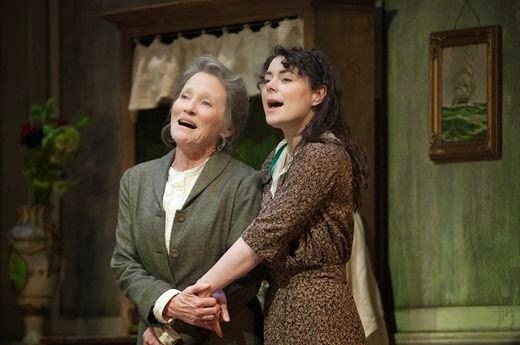 I regret that I wasn’t able to see another of my favorites, Corrine Koslo, as Maisie Madigan; at the performance I attended, Donna Belleville stepped in to replace her, and though it was a game try, Belleville wasn’t quite right for the part. (She’s much more at ease in The Charity That Began at Home.) The ensemble is the raison d’être of this Juno. They place themselves at the service of O’Casey’s great play, which seems as towering an achievement now as it must have seemed nearly a century ago.